You can’t have too much of a good thing, right? Eh, this is not always true. Can you have too much money? Probably not. Can you do too much cardio? Yes, you can. 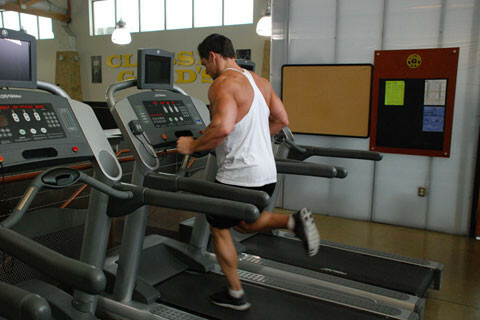 Cardio is an integral part of the pre-contest formula. Along with diet, weight training, and supplementation (which may include the use of AAS), cardio helps you to shed unwanted body fat so that your muscles will be better displayed on-stage. Many bodybuilders, particularly those embarking upon a pre-contest diet for the first time, will not yet have a grasp upon how much cardio to complete each day in order to be ready for a show on a particular date. They’ll be 4, 6, or 8 weeks out and suddenly realize they’re either going to be ready too early, or not in time. Here are a few tips for timing your peak, in terms of cardiovascular training. Don’t change a thing. You should be on pace to be just about lean enough, two weeks out from a show. This will allow you to time your water deprivation and carb-up just right in the week of the show. Many bodybuilders are seen pedaling like crazy on the exercise bike, the night before the show. This is the sign of a man who is going to look his best exactly one week AFTER the show. You want to prime up to a show, and depriving your body of glycogen just hours before a show is a terrible idea. Keep all of the factors constant, and keep plugging away! Add fats and some proteins to your diet. Keep the cardio consistent. You are likely not consuming enough calories. You may be blessed with a better metabolism than you think, or you may be reacting to the ECA (or Clen or whatever supplement you’re using) better than expected. Whatever the reason, you should understand it is important not to peak as early as 4 weeks from the show. This will result in your losing muscle in that last month as you try to keep your body fat low. Remember that the human body isn’t designed to sit around at 4% body fat for extended periods of time. You’re behind on your preparation, but it’s not time to panic. Lower your calories. You should already be completing one cardio session upon waking each morning, before you consume a single calorie, in a session length up to 45 minutes. Perhaps you need to add a second session in the evening, for up to 30 minutes. Many professional bodybuilders (utilizing professional level steroid stacks) will use 1+ hours of cardio, twice per day, but that is excessive for most people. Doing too much cardio will result in burning up your muscle, and will send your central nervous system into shock. If you do realize that peaking in time isn’t in the cards, you can always reschedule your show. It’s a better option than pedaling away all your hard-earned muscle, or walking on-stage in less-than-stellar condition! This entry was posted in Training and tagged Bodybuilding, Cardio Training, Muscle Building, Muscle Growth. Bookmark the permalink.